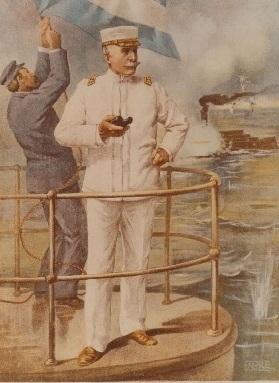 Shortly thereafter President McKinley dispatched the Philippine Expeditionary Force under General Wesley Merritt. By July 30th over 10,000 troops led by General Wesley Merritt, General Francis V. Greene, and General Arthur MacArthur arrived. They were joined by 30,000 Filipino troops under General Antonio Luna, who had dug fourteen miles of trenches around the city of Manila during the summer. On August 4th Dewey gave Spanish Governor Fermin Jaudenes 48 hours to surrender. The deadline was later extended five more days as Dewey attempted to work out a bloodless solution. A short battle ensued beginning on August 13th. The Spanish surrendered within a few days, thus ending the fighting in the Philippines.